Remote Desktop Control does exactly what the name says: it allows you to manage a remote computer from another computer, through internet. There are many solutions out there to achieve this result. In this case we will give a look at two of the most popular: Google’s Chrome Remote Desktop vs Teamviewer. Teamviewer on Nexus 7, ready to connect to remote PCs and Macs. TeamViewer is for free private use. It is not browser-based, meaning that you will have to install the program on your PCs and Macs to use it. You can throw it on your thumbdrive and can carry around with you. The installation on your PCs and Macs is pretty straight forward: you download the program from the Teamviewer’s homepage, and follow the onscreen instructions. To have complete access to your computers you will have to install the Teamviewer on everyone of them. You can use Teamviewer on your PC to control a Mac, and the other way around (Cross-platform). Compared to Google’s Chrome Remote Desktop, Teamviewer has a big advantage: you can install it on your tablet and remotely control your PC from there (but not the other way around!). I have a Google Nexus 7 from 2012 and 3 PCs. 2 of these are in another house. To check if these 2 are connected, I rely on Teamviewer on my tablet. The Nexus 7 sits next to the main screen of the PC I am currently writing on, and every once in a while i give the tablet a glimpse to check is the downloads are active (and if anyone is breaking into my apartment, through the PCs webcam. But that’s me being paranoid). Teamviewer also has specific features for Windows 8, making it easy to access of Start menu, charm bar and app menus. Most importantly, the remote control emulates the touch gestures. This is fantastic if you are remotely controlling your PC from a touch notebook or a tablet. The program allows you to restart the remote computer. It will then reconnect automatically, even if the remote PC is started in safe mode. It also allows you to hear and see music, videos or system sounds from the remote computer during a connection. The issue is that the whole experience can result a bit laggy, from time to time. Nothing excessive, especially with a good connection from both the PCs involved, but it is definitely felt. In this post we are just talking about the remotely controlling another PC. Teamviewer offers many other tools beyond this possibility. You can discover them on the Teamviewer’s homepage. Chrome Remote Desktop is free, but requires you to install Google Chrome, along with the extension from the Chrome Web Store. 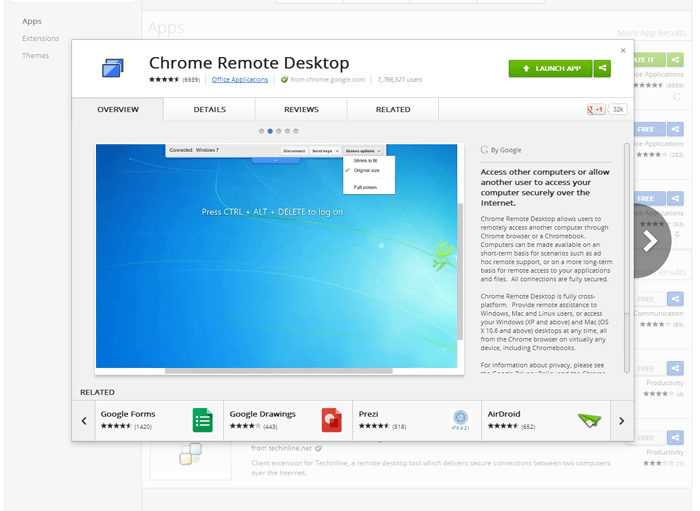 Chrome Remote Desktop is fully cross-platform, meaning that you can connect to Windows, Mac and Linux(Linux is not possible with Teamviewer) desktops at any time. Of course, all these OSs will have to have Chrome browser installed, along with Chrome Remote Desktop, if you want to control the desktop remotely. Unfortunately, Chrome Remote Desktop only works from PC/Mac to PC/Mac and not from Tablet to PC/Mac or the other way around. I am sure that soon they will update the app and this feature will be available. 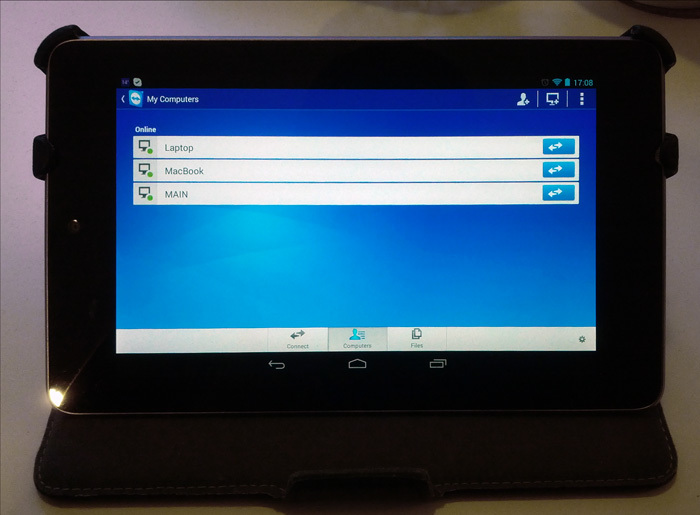 Teamviewer also allows you to transfer files from a PC to another (and from the Tablet to the PC, and the vice-versa). While being used, Chrome Remote Desktop has a better overall experience. It feels smoother and the sound sharing just works perfectly. The big issue is that you will have to be signed in with your Google account on all the computers involved. This point leads to the fatal flaw, in my opinion, in Chrome Remote Desktop: After some time, your Google account sign-in expires, and you are logged out from the browser. When that happens, you will not be able to remotely access your PC/Mac anymore, unless you go back there and sign-in in loco. If you are on vacation, 3’000 KM away, that can result quite impossible, and you will not be able to access your PC. Teamviewer, on the other hand, asks you to log in once. After that, your PC will run the program until you manually shut it down. It is not optimized for Windows 8, but it works just fine on it. Bottom line I would say this: If you need a remote desktop controller for two or more PCs within the same house, then Chrome Remote controller is the easiest and, possibly, the best solution. If instead you need something more reliable and stable, but also a bit more invasive, Teamviewer is the solution for you.